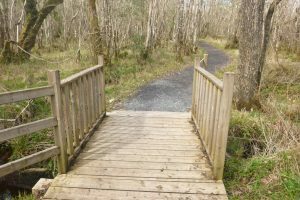 Ardnamona Wood Nature Reserve is a fine oak woodland, some 46.6 hectares in size which lies approximately 5km north-east of Donegal Town, just west of Lough Eske. The site consists of old Oak woodland, a listed habitat on Annex 1 of the EU Habitats Directives. The woodland is of scientific interest for its size, natural heritage, and flora. 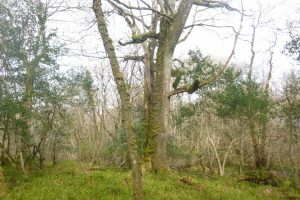 The wood displays habitats of dry areas dominated by Oak, and wet woodland with Alder, Ash, Rowan and Downy Birch also occur in the high canopy with Holly, Hazel, and Willow in the understory. The site is also host to the Killarney Fern, a red data book species listed in Annex . of Habitats Directive. Two other rare plants, Whorled Caraway and Six-stamened Waterworth, are also present. Rhododendron ponticum is a non-native invasive evergreen shrub that completely takes over from native flora. It was introduced into Ireland, in the early 1800’s, by landlords and estate owners to provide cover for game. Since then it has spread or been introduced to many parts of Ireland. We may all have noticed those ‘wonderful pink flowers’ blooming across the hillsides of Ireland in May-June, little realizing or understand the grave damage they are causing. Rhododendron replaces the shrub layer in Oakwoods, blocking out most of the sunlights access to the woodland floor, making the woodland totally unsuitable for birds and other animals to live in. It also prevents oak seedlings from regenerating. Fortunately, Rhododendron has been almost completely removed from Ardnamona wood after years of cutting and spraying. in 2005 a new circular path was constructed through the woodlands by the National Parks & Wildlife Services. This path begins just inside the main gate and veers off to the right. After about 2km the path rejoins the main avenue, which links back to the main entrance. 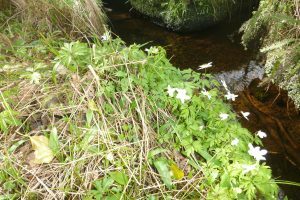 Plants to look out for when visiting Ardnamona Wood are Wood Sage, Bluebell, Foxgloved, Bugle, Wild Garlic, Wood Sorrel, Lesser Celandine, and Wood Anemome. In the nearby Lough Eske and River Eske, two very important Annex . species are present, namely the Freshwater Pearl Mussel (River Eske) and Artic Char (Lough Eske).